A picture of my grandfather Hirsch-Meir Rachowitz (standing on the left), his mother, Rachel Rachowitz Richter (later murdered on March 27, 1944 at age 64 in the Kovno/Kaunas Ghetto in the special Aktion; i.e., on March 27-28, 1944, a special Aktion took place in the ghetto, in which 2,500 children, elderly and sick persons were hunted down; please see details below), his father Abraham Rachowitz (later murdered on March 27, 1944 at age 64 in the Kovno Ghetto in that same special Aktion), and his four sisters: Taybe, Malka, Esther-Hinda (Hinda died in the Kovno Ghetto on June 5, 1942) and Hene/Hannah (standing on the right). Hene Veller survived the Kovno Ghetto but two of her three children, namely Shayne and Israel-Abba, were killed in the ghetto in that same special Aktion (Die Kinder-Aktion, see below), and only her daughter Leah stayed alive. Taybe and Malka were deported from the Kovno Ghetto to the Stutthof concentration camp, but survived. Fortunately Hirsch-Meir managed to escape the Holocaust by fleeing East, to the Soviet Union one day after the Germans invaded the Soviet Union. 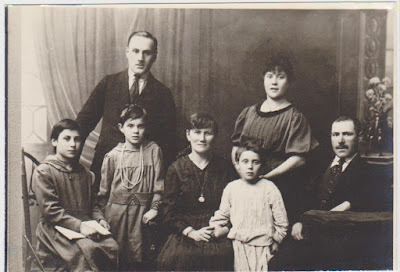 In other words, on June 23, 1941, my grandfather Hirsch-Meir, together with his wife, Rivka-Rachel, and their two children, Aaron-Israel (my father) and Nathan, managed to escape into the Soviet interior amidst heavy bombardments and attacks by the Germany. They boarded the last train (actually a freight train) in Kovno, whose mission was to evacuate the families of the Soviet forces stationed in Lithuania (please see Aaron's Life Timeline, above).